Our customer saw an opportunity to enter an emerging market for a new class of scale-out Flash array storage and decided to create a new business unit to serve this market. Wanting to get into the market quickly and without a staffed business unit, our customer turned to Lumenir for help. Within the first month, our team worked with the customer to create the product concept, architecture, and product requirements definition. In addition, Lumenir architected the enclosure services firmware as part of the system’s functional requirements. Beginning with a product feasibility study, our team used 3D solid modeling, computational fluid dynamics (CFD), finite-element analysis (FEA) to model the enclosure design. Our team also worked strategically to select, negotiate and engage a silicon partner for a high-speed SAS expander. We also performed Signal Integrity and Power Integrity analysis to ensure a robust design with design margin. With the product definition and architecture complete, the team then designed, fabricated, and brought-up prototypes for early customer feedback. To accomplish this, the Lumenir team completed the mechanical and electrical designs, designed the PCB’s, sourced all the materials, and assembled prototypes. Because of Lumenir’s design approach, all hardware was brought up first pass with no costly redesigns required. It also provided a stable hardware platform for Lumenir to subsequently develop an FPGA, firmware, and a fully functional system. Lumenir seamlessly transferred the design to its customer’s newly formed engineering team via thorough documentation, well documented source code, and design reviews. Lumenir then provided ongoing support including a firmware team lead to enable them to deliver on schedule to their customers. Today, our customer’s derivative products are still based on Lumenir’s initial architecture. In short, Lumenir helped its customer pave the way to new and larger opportunities. A manufacturer of SSDs needed a new generation of test equipment to test their new 12Gb SAS and Gen3 PCIe products. They came to Lumenir for help on the architecture, PCB firmware, and software designs. 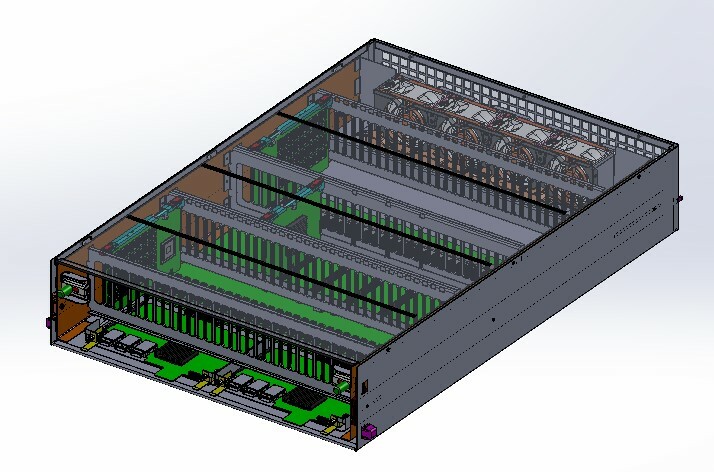 Lumenir helped to refine and document the test requirements, create the hardware architecture, select key components and engage a silicon partner for a high-speed SAS expander. With the product definition and architecture complete, the team then designed, fabricated, and brought-up prototype test hardware. To accomplish this, the Lumenir team completed the mechanical and electrical designs, designed the PCB’s, sourced all the materials, and assembled prototypes. We also performed Signal Integrity and Power Integrity analysis to ensure a robust design with design margin. Because of Lumenir’s design approach, all hardware was brought up first pass with no costly redesigns required. It also provided a stable hardware platform for Lumenir to subsequently develop, firmware, and a fully functional test system. Lumenir also designed and implemented all the firmware used to initialize and control all the key components including SAS and PCIe silicon, as well as Windows and Linux CLI software needed to interface to the boards from the test system. After the initial systems and features set were delivered, Lumenir provided ongoing firmware and software support to allow the test equipment to be used in additional applications within the company.